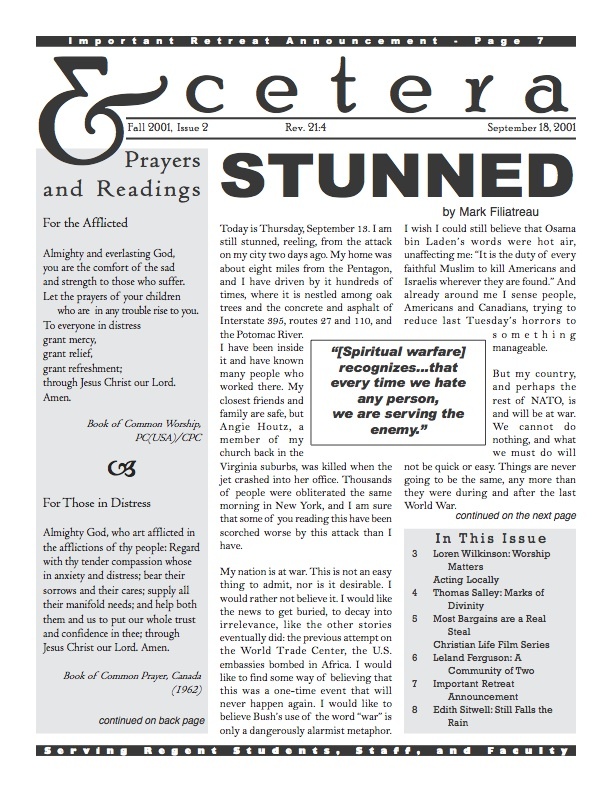 The second issue of the 2001-02 Regent College Et Cetera, dated September 18, 2001. Ten years ago today, I began my year-long run as editor of the Et Cetera, the official student “newspaper” of Regent College. I put “newspaper” in quotes because it’s not like most student newspapers around the country. Regent College is a fairly small, fairly tight-knit community of theology students, and our newspaper (when I was there) consisted mostly of run-of-the-mill announcements and anything-but-run-of-the-mill theological essays. Over the rest of that semester, our community debated the meaning of 9/11, the appropriate responses to violence, anger, and mourning, and any number of political and theological issues related to the attacks. In these first two issues of that year, you can get a sense for how the Regent community operates. P.S. I’m fairly certain that I don’t have permission to post the contents of these two issues online, but I hope no one minds. If you’re one of the writers and you’d like me to take your article offline, just let me know. This entry was posted in Culture, Society, and Politics and tagged regent college, september 11 by mhick255. Bookmark the permalink.